Abstract: There are many applications that require long wavelength, large, uniform, reproducible, low cost, stable, and radiation-hard infrared (IR) focal plane arrays (FPAs). For example, the absorption lines of many gas molecules, such as ozone, water, carbon monoxide, carbon dioxide, and nitrous oxide occur in the wavelength region from 3 to 15 microns. Thus, IR imaging systems that operate in the long wavelength IR (LWIR) region (8-15 microns) are required in many space borne applications such as monitoring the global atmospheric temperature profiles, relative humidity profiles, cloud characteristics, and the distribution of minor constituents in the atmosphere which are being planned for future NASA Earth and planetary remote sensing systems. Currently, we are working on Superlattice detectors, multi-band Quantum Well Infrared Photodetectors (QWIPs), and Quantum Dot Infrared Photodetector (QDIPs) technologies suitable for high pixel-pixel uniformity and high pixel operability large area imaging arrays. Due to higher radiation hardness, lower 1/f noise, and larger array size, the GaAs based QWIP FPAs are very attractive for such space borne applications. Furthermore, we have exploited the artificial atomlike properties of epitaxially self-assembled quantum dots for the development of high operating temperature IR FPAs. Additionally, the closely lattice-matched material system of InAs, GaSb, and AlSb, commonly referred to as the 6.1Å material system, has emerged as a fertile ground for the development of new solid-state devices. The flexibility of the system in simultaneously permitting type-I, type-II staggered, and type-II broken-gap band alignments has been the basis for many novel, high-performance heterostructure devices in recent years, including the GaSb/InAs type-II superlattice IR detectors. In this presentation I will discuss the optimization of the detector design, material growth and processing that has culminated in realization of III-V based IR detectors, large format FPAs, and IR cameras which hold great promise for myriad applications in 3-15 micron wavelength range in science, medicine, and industry. 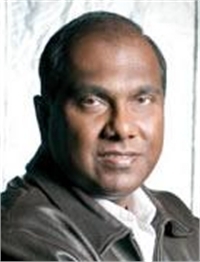 Biography: Sarath Gunapala received his PhD in Physics from the University of Pittsburgh in 1986. Since then he has studied the infrared properties of III-V compound semiconductor hetero-structures and the development of quantum well infrared photodetectors (QWIPs) for infrared imaging at AT&T Bell Laboratories. He joined NASA's Jet Propulsion Laboratory at California Institute of Technology in 1992 where he heads the Infrared Photonics Technology Group. Sarath is also an IEEE Senior Member, SPIE Fellow, and senior research scientist and principal engineer at the Jet Propulsion Laboratory, California Institute of Technology. Sarath has authored over 250 publications, including several book chapters on QWIP imaging focal plane arrays, and holds twenty patents. He has received numerous awards including the NASA Exceptional Engineering Achievement Medal, NASA/AIAA Effective Partnership Award, and induction to United States Space Technology Hall of Fame 2001.